Indianapolis has a thriving entrepreneurship culture, and this is driving a boom in coworking spaces. Freelancers make up the bulk of people who use these sites, but more companies are embracing remote work to improve work-life balance of employees. Now, everybody is searching for a nice place to work, have fun, and network without the limitations of traditional offices. Thankfully, Indy has multiple coworking spaces where you can unleash your productive spirit and enjoy the best coffee in town. Industrious is a popular coworking outfit among freelancers in numerous cities. But few people know that the company started in Indianapolis. Industrious Indianapolis has one of the most collaborative office spaces in the city. From its central location and comfortable setting to the friendly staff, there is something for everyone here. The site offers reliable Wi-Fi, plenty of natural lighting thanks to the large windows and glass walls, a beautiful and modern office setting, and the coffee never stops. There is also tea if caffeine is not your thing, and complimentary snacks are plenty. 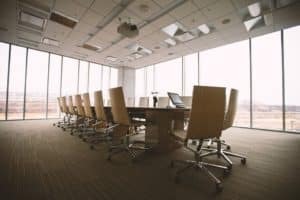 The office space is squeaky clean, the toilets are neat, and you can rent desks, office spaces, and even conference rooms for your company events. Being a member also gives you access to Industrious locations in other cities, making it perfect for people who work on the move. If you love your working space cozy and clean, the Haverstick is the place for you. The Haverstick is a coffee place and coworking space where you can work, relax, and have a good time. The place is attached to a church and you won’t have any problem with parking. The coffee is a blast and you can bring your kids, too. The Haverstick is the perfect place for remote work for groups. The site provides lots of couches, large tables, and plenty of floor space. If you enjoy working alone, you will find plenty of small tables and power outlets to have to yourself. The internet is super fast, the coffee is delicious, and the friendly staff won’t let you down. The Bureau is at the center of things in Indianapolis. This coworking space is in the Hinge Building beside the famous Cultural Trail, so you won’t have any problem finding it. The Bureau takes remote work to another level with its outdoor working space, natural lighting, and huge windows. You will find the standard and super cozy seating arrangement relaxing, and there are standing workstations, too. There is a gym on site, bike stations, printing resources, and small phone call rooms. The internet is fast, coffee aplenty, and The Bureau provides monthly education events to its patrons. This place combines a simple design with industry-best services to deliver a coworking space like no other in Indy. Are you looking for a comfortable coworking space with a friendly atmosphere? The above sites offer a wonderful experience and top value for money.